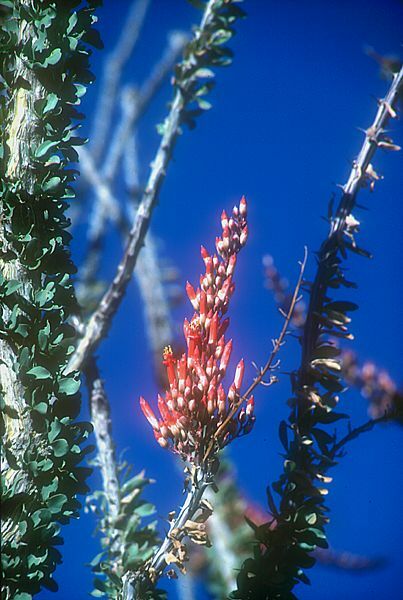 The family Fouqieriaceae contains the single genus of spiny succulent shrubs and trees, Fouquieria. All species are native to Mexico and the Southern USA. includes around 11 species of xerophytic woody shrubs or trees. Stems are succulent to semi-succulent and furnished with spines which are the remains of leaf midribs from the first leaves on each stem. 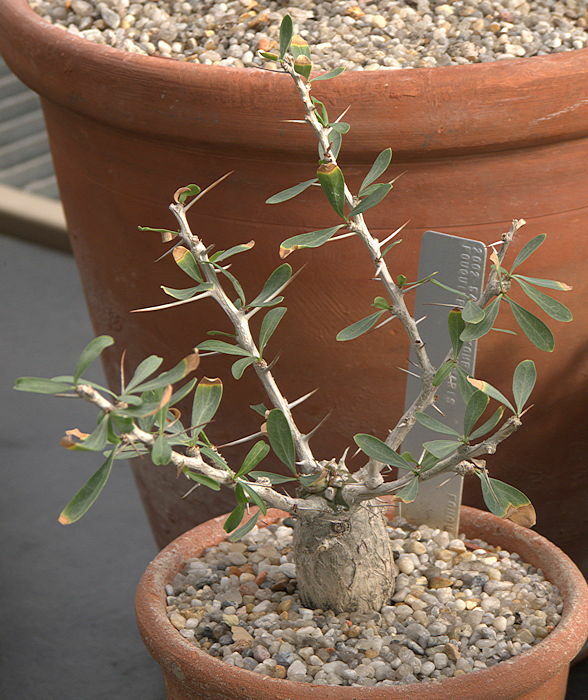 Subsequent leaves do not leave spines. Clusters of oval green leaves are produced in response to rains and shed quickly when conditions become unfavourable. Fouquieria species are found in Mexico and southern parts of the adjacent USA. Only F. splendens grows naturally in the southern USA. Name: possibly after the quicksilver mine of New Idria, San Benito, California, itself named after the Idrija mine in Slovakia. The monotypic genus Idria includes the unusual succulent columnar tree Idria columnaris Syn. Fouquieria columnaris. Common Name: Boojum applied by Godfrey Sykes, Desert Botanical Laboratory, Tucson, Arizona from a mythical dangerous animal in "The Hunting of the Snark" by Lewis Carrol (1867). Cirio - slender tapering altar candles. 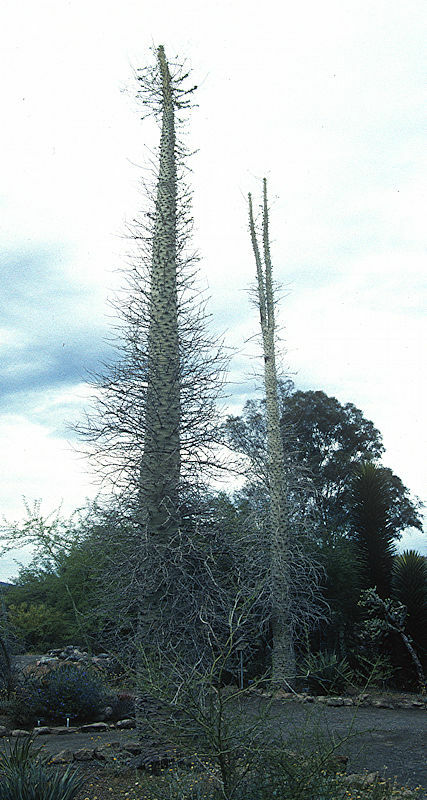 Fouquieria columnaris has a substantial tapering succulent greenish trunk up to 50 ft tall, surrounded by short spiny branches bearing clusters of leaves after rain. The main trunk elongates during the winter and with age may split into two or more stems near its apex. The spongy wood retains water and may develop cavities that house nests of honey bees. The trunk carries clusters of fragrant white to yellow tubular flowers at its apex in late summer. This is probably the most succulent Fouquieria. Native to Baja California and a small region of Sierra Bacha on the Sonoran mainland, Mexico. A pair of fine specimens may be seen in the Desert Botanic Garden, Phoenix, Az. Exceptionally slow-growing. 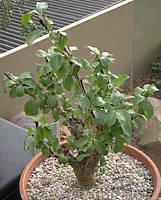 A shrubby tree up to 20ft tall with a short, thick greenish trunk with thin peeling bark, from which arise many spiny reddish-brown branches with small drought-deciduous leaves. The wood may contain up to 70% water. Clusters of long, tubular scarlet flowers on long petioles are produced at the ends of branches in the Spring and intermittently throughout the year. 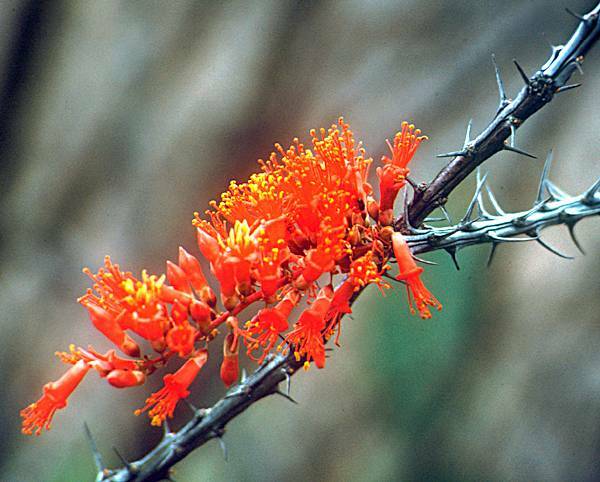 Native to rocky hillsides in the states of Western Chihuahua, Sinaloa and Sonora, Mexico at elevations of 500 - 2500 ft. The flowers are attractive to humming birds. This spiny trunkless shrub produces many 15 ft or more tall stems arising directly from its base. The small primary leaves have a durable petiole which develops into a protective thorn when the leaf is shed. 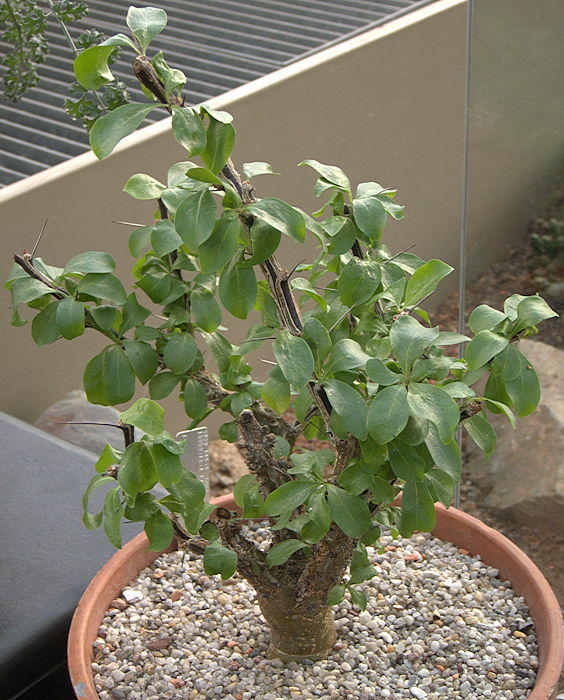 The plants are a sensitive indicator of surface moisture, and the leafless, gray, thorny stems sprout secondary green leaves immediately after rain. These leaves are different from the primary leaves, in not leaving a thorny midrib behind when shed. The leaves are lost as the soil dries out but may re-appear several times a year, depending on rainfall. Upper left: An impressively large specimen of F. splendens growing in the Anza Borego Park, Californa near the San Felipe wash - the type habitat for Agave deserti. The waxy tubular nectar-bearing flowers, produced in dense clusters at the end of the stems in the Spring, are attractive to humming birds, finches, bees and other insects. Later in the year, the flowers are replaced by clusters of decorative orange seed pods. Sporadic flowering can continue through the Summer and Autumn depending on rainfall. Lower left: Flowers of F. splendens growing on a limestone escarpment above the Rio Grande at Langtry, Texas in April 1990. 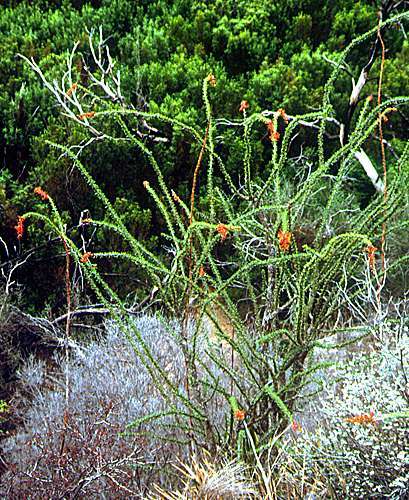 Although this specimen was not in leaf, in the same area most Ocotillos had leaves suggesting that there had been rain recently. Fouquieria splendens is the only member of this genus native to the the lower end of the USA with a distribution from Texas to Southern Nevada and California and into Mexico. 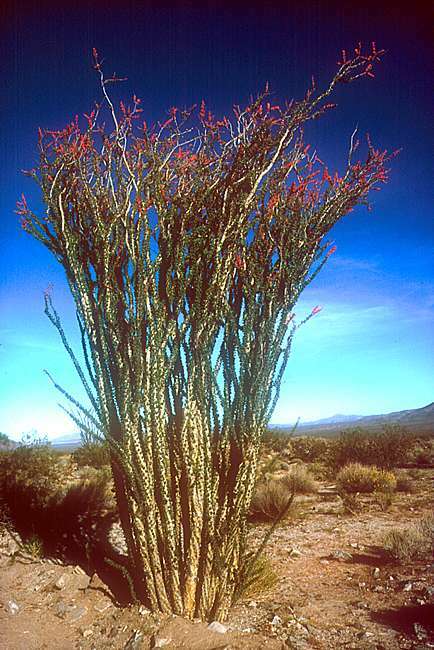 The Ocotillo is found in the Mexican states of Baja California, Sonora, Chihuahua, Coahuila, Nuevo Leon, Durango, and Sinaloa. 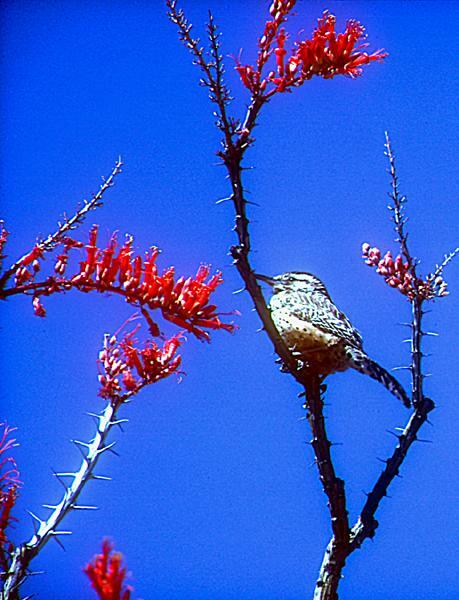 In Mexico and parts of Arizona the Ocotillo is traditionally used as a living thorny fence, testifying to its ease of cultivation and it is often said that a stem cut off and stuck in the ground will grow in a warm, frost-free climate. It is also said that the orientation of the stem is important and that the original South-facing side should be placed to again face the South. In Southern Arizona I have seen cut stems of F. splendens used as reinforcement in lath and plaster or adobe house walls which had crumbled with age to reveal their internal structure. In the UK, Fouquieria splendens grows well in an unheated, frost-free conservatory throughout the year, but especially well during cloudy cool weather which seems to act as a stimulus for leaf production. The plant should be watered liberally when leaves first appear, and a little water given from time to time until the leaves are seen to begin to go yellow and die. When this happens, further watering will not save these leaves: to avoid the risk of damage to the roots and lower stem it is best to withdraw water and allow the plant to rest. A little water may be given from time to time during dormancy to see if conditions are correct to initiate leaf production. My plant continues in leaf during the winter months if given a little water, and I have known it produce 2 in (5 cm) of stem growth at this time of year. It is potted up in a very gritty mixture in keeping with the gravelly soils in many parts of its natural distribution. Despite its ericaceous affiliations, F. splendens can be seen to thrive on a wide range of soils derived from limestone, sandy and igneous material suggesting that soil pH is not critical. On the last occasion of re-potting my plant, the roots were mainly near the surface of the compost and not utilising the full depth of its 5 in pot, so it was replanted in a shallower but wider clay bowl.